On the last 24th May EIOPA launched the EU-wide Insurance Stress Test 2016, whose results will be disclosed next December. The participants from the industry submitted their results on the 15th of July to the National Supervisor Authorities (NSA), which are validating the figures by August; EIOPA will make the final validation next September. Compared to the 2014 Stress Test, the target participation rate (market coverage in terms of gross life technical provision) has been raised from 50% to 75%, in order to include an adequate number of medium and small size undertakings and mutual for each national sample. The participants are solo undertakings (no insurance groups) with long term business and mixed insurers that offer any type of interest guaranteed products. – LTG and transitional measure approved by the NSA can be used, but their impact has to be indicated (i.e. the calculus has to be performed with and without the adjustments). Those adjustments shall be calculated in the pre-stress scenario and then kept constant in the post-stress scenario. 2. Low for long: it is focused on a prolonged low yield environment. 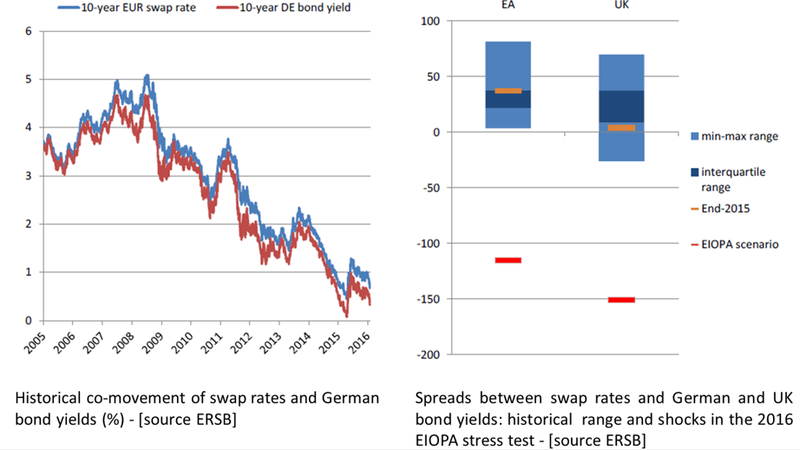 It has been specifically designed by EIOPA looking at the lowest spot rates recently observed in the market (EUR in the past 2 years): the liquid part of the curve (till 20y for EUR) is shifted with a downward shock of 15bps including the CRA and the extrapolation is carried out with an UFR reduced to 2% given the low level of the rates. This value is in line with the inflation target set by the ECB, assuming that no changes in the trend are foreseen for the near future (no growth in the next 60y). The other parameters, like the spreads and the volatility adjustment, are considered unchanged with respect to the base line valuation. 3. Double hit: it assumes two financial market shocks to materialize simultaneously. A fall in swaps rates and a rapid increase in yields of sovereign bonds (that leads to a steepening of cash yield curves) are assumed to be instantaneous and simultaneous (no need to further aggregate the results through a correlation matrix). This scenario has been developed in collaboration with the ESRB (European Systemic Risk Board) to assess the systemic risk in the EU financial system. It assumes a generalized increase in risk premia: the required rate of return for holding long-term fixed income assets increases sharply (bond prices decline consequently), concerns on the creditworthiness of some EU sovereigns are set alight again and yields of non-financial corporate and bank debt increase as well. Shocks to credit spreads are made worse by worries on the mark-to-market losses of fixed-income assets (the credit spread for the AAA class barely increase, but weaker issuers are impacted). 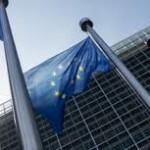 Higher cost of finance and lower expected demand deteriorate the prospects of future earnings of the EU corporate sector, causing a fall in the stock prices. Financial assets are sold and the excess of liquidity is invested in very short term assets, reducing the forward interest rates and therefore the swaps rates (that reflect expected future short term interest rates). This scenario assumes a very extreme situation, trigger by two events (fall in swap rates and increase in government yields) never observed simultaneously in the past: the joint probability of the scenario is much lower than the estimated marginal ones (0.50% for swap rates shocks and 0.75% for government yields shocks measured over a one year horizon). In this scenario swaps rates fall by about 60 to 70 bps, while the EU government bond yields increase on average by 121 bps at the ten year maturity. The value of the latter varies a lot depending on the country (e.g. 78 bps for Sweden, 487 bps for Greece). Stock prices fall on average by 33%, again with high differences on the countries. The proposed calibration is far worse than the one adopted in the 2014 EIOPA stress test. This double hit scenario impacts both sizes of the insurer’s balance sheets: on the asset side insurers are particularly vulnerable to a fall in global asset prices and on the liabilities side they suffer low risk free interest levels. EIOPA will analyse the Macaulay duration of the liabilities and the cash flows profile in order to investigate the reinvestment risk and to compare the maturity rate bucketing of asset and liabilities. Unless strictly required by the NSA, sensitivity on the effects of the decline of the interest rates on the derivatives is performed on a voluntary basis, being the risk material just in some jurisdictions.